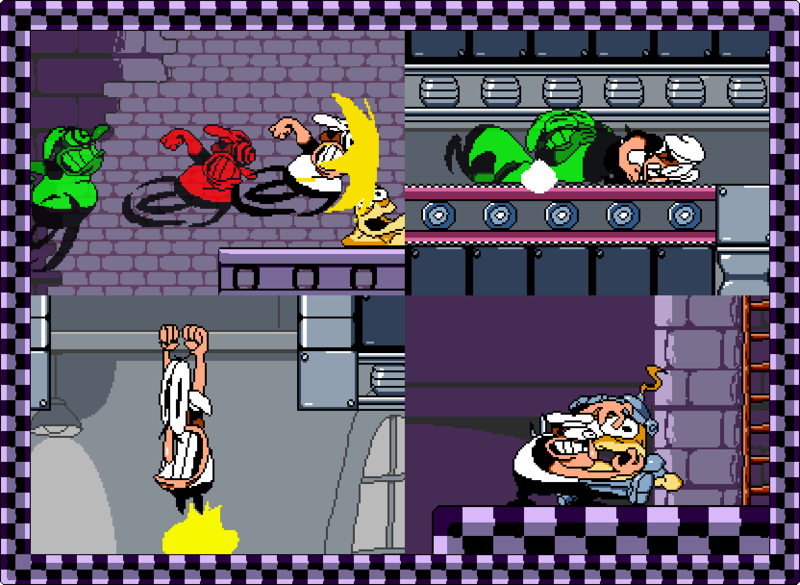 Pizza Tower is a 2D platformer mainly inspired by Wario Land and Earthworm Jim. The game has over the top hand-drawn animations and music. You play as Peppino Spaghetti, a manic pizza man with many abilities like charging, super jumping and dashing. Peppino has to go up each floor of the tower by finding keys, saving toppins folks and getting as many points as possible! Luckily, Peppino cannot die in this game, but this does not mean the task will be easy since "The Noise" and his henchmen have many traps to impede his progress. Peppino also has the ability to use different transformations that may impede or help him depending on the circumstances. For example, Knight Peppino can destroy metal blocks underneath him but is clumsy and slow. Your financial support is greatly appreciated as I can dedicate more time working on the game and animations! The money will also be going towards my composers which are doing a phenomenal job at giving a unique atmosphere to the game. We plan on releasing Pizza Tower on Steam and itch.io. The animation, coding and design guy. The main composer and sound effect guy. -Thanks for supporting the game! -Cheesy role on the Pizza Tower discord that will put you at the top of the hierarchy. -Your name in the credits! Wiener is one letter away from "winner"! -You get access to a patron exclusive builds! -Weenie role on the Pizza Tower discord to show you aint the kind of guy to be messed around with. You da man, like this pineapple. -Cool role on the Pizza Tower discord to make everyone bow before you when you step in. Maximum speed! I can dedicate myself fully into making this game!